The title says it all. With Sunday's night's fumble fest in the books, I thought I'd take a quick and dirty look at how cold temperature affects fumbling. It was 19 degrees in Foxboro when I checked the weather there in the 4th quarter. I looked at all plays from 2000 through the 2012 regular season, excluding kneel downs and spikes. I counted all fumbles, not just fumbles lost. Keep in mind the sample sizes greatly diminish at the temperature extremes. 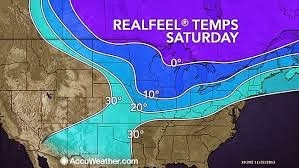 It appears that very cold temperatures may have an effect on fumble rates. The average fumble rate was 1.79%. 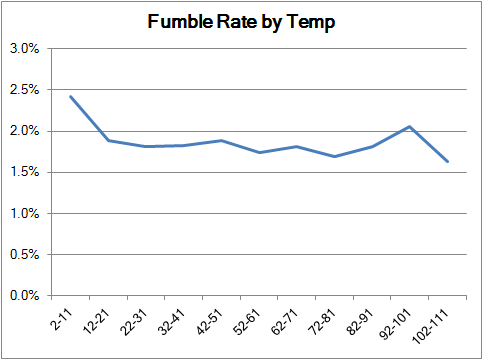 For extremely cold temperatures, the fumble rate was 2.42%, a 35% increase from the norm. There were 909 plays in the 2-11 degree bin, which means that the p-value was 0.08. That's considered marginally significant. But there are 11 bins of temperate, giving the results 11 chances to produce a type I error. Where did you get all that weather data? very interesting piece of data. just one question though. when have games been played in 91+ conditions. i can only think of az games but again wouldn't those have to be in like the really EARLY part of the season. also, since az is in a dome im guessing they don't use ac there?? still, a very nice way to look at fumbles. thanks as always!! An easy way to eliminate team-proclivity bias, but halve the sample size, is to only look at visitor data. Temps come from official league gamebooks. I would look at fumbles per running play, not all plays. Sure, but why? More fumbles happen on pass plays than run plays. 22 fumbles in that cold bin, instead of the expected 16.3 fumbles. I would have guessed a much larger difference. I am also very surprised that there is no effect in the 12-22 degree bin. That is darn cold. I'd imagine wind chill effects would make a lot of those days seem much colder as well. This is very interesting, what effect do you think windchill plays in fumbling? Last night's game was 20 degrees, but with windchill it felt like 6 degrees. If you only consider temperature then games like the Broncos-Patriots game last night should have normal fumbling rates, but if you consider windchill such games should have increased fumbling rates (assuming no type I error). On an anecdotal note, I was at the game last night and the wind was painfully cold, I could hardly secure a beer much less a football. I think this post makes a lot of intuitive sense. Ask and ye shall receive. Thanks for getting this info up so quick good sir. Last night was 23 degrees at the start of the game but I do believe it got lower than that pretty quick. Looks like the fumbles start to go up sharply at 20 degrees... in school recess fumbles would go up in the cold but thats because we were all wearing woolen mittens, not an excuse NFL players have. It would be funny to see Gronk trying to catch a pass with a huge wool mitten on. Thanks again. It's not that big of a difference, but I could agree that the extreme temperatures including extreme heat would affect all points of play, not just fumbles. You should find the INT% for this article.